first chicago meet? when are u guys getting your cars out? we all need to go meet somewhere, maybe a little galena-like trip like last year (that i wasnt able to attend), or a drive and some pics...anything of that nature. or just go get some pizza and talk about the upcoming autoX or whatever. I'm with you, DJ. I can't wait until it gets warm enough. I took a chance and drove the BoxS on Wednesday to the mall. It was slippery with summer tires, but I managed ok. I had a great time at Galena last year, we should do that again. What about an Alphabet run up in WI? I keep hearing about this AutoX stuff... I might have to try it out this year. I wanted to get the Box out in march... but it's probably going to be April now. 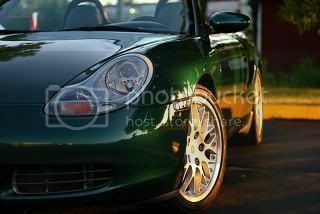 In the mean time I'm ordering my new Mich PS2's (all around) for what will be a great summer of top down fun! I guess that means we go South! im heading to eagle ridge resort with my wife of 16yrs and our boxster for some fun..hows the drive..what should i look for??? pics of my 8-15-08 trip to galena with my lovely bride and ride.